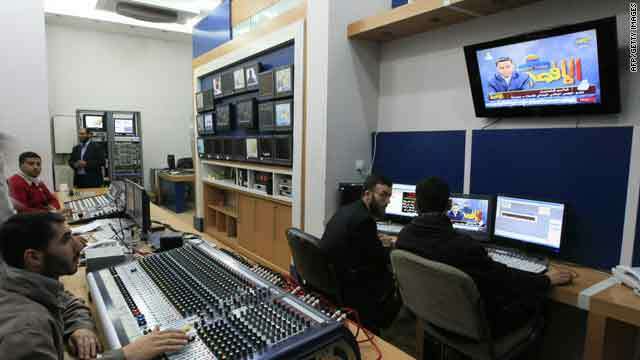 Al-Aqsa Television employees work inside the station's studio in Gaza City on Thursday. (CNN) -- The U.S. Treasury put a bank and a television station -- both from Gaza -- on its terrorist-financing list, saying they were controlled by Hamas, the Palestinian Islamist movement. Islamic National Bank provides banking to Hamas members who also finance and control Al-Aqsa Television, U.S. officials said. "Treasury will not distinguish between a business financed and controlled by a terrorist group, such as Al-Aqsa Television, and the terrorist group itself," said Stuart Levey, under secretary for terrorism and financial intelligence. The designation allows the Treasury to prohibit firms from doing business with the companies and freeze their assets in places under U.S. jurisdiction. U.S. officials consider Hamas, which runs the Palestinian territory of Gaza, a terrorist organization. The statement accused the bank of not operating under Palestinian authority regulations and providing Hamas with a means to receive and store smuggled cash. In May 2009, the Hamas finance office moved about $1.5 million into the bank to pay salaries of Hamas military wing members who had accounts there, according to the Treasury. "Consistent with our commitment to a well-regulated and transparent financial system in the Palestinian territories, Treasury will continue to expose Hamas's efforts to create institutions with the trappings of legitimacy that are in fact controlled by and used to support a terrorist organization," Levey said. The militant group has ruled Gaza since 2007. Hamas officials did not immediately respond to the accusations.